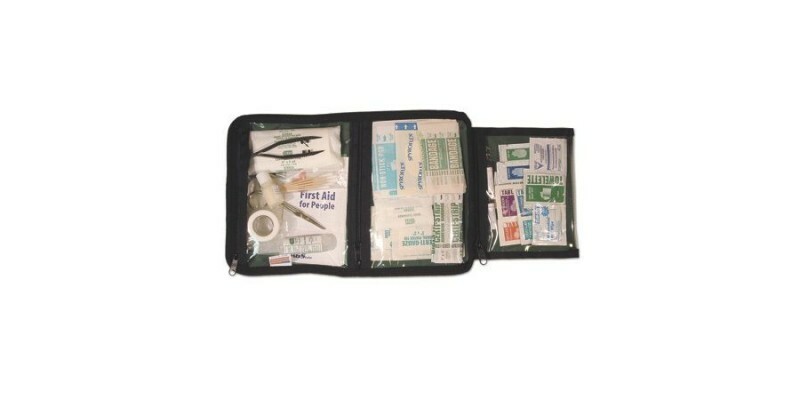 PEOPLE/PET FIRST AID KIT:This kit contains: Bandage scissors. adhesive tape. sterile gauze pads. non-adherent gauze. conforming gauze bandage. knuckle & butterfly bandage. spyroflex blister dressing. sterile cotton-tipped applicators. tweezers. antiseptic towelettes. vionex antimicrobial towelettes. triple antibiotic cream packet. hydrocortisone cream packet. povidone iodine swabs. sting relief pads. ibuprofen. acetaminophen. diphen. diotame alkalak. synthetic gloves. safety pins. eye & skin wash. vet wrap. First aid Pamphlet & Pet Emergency Card.